The various pipes in an underground mine are typically affixed to the roof. Bolting them on has typically been backbreaking work for several men. Uintah's pipe handling trailers take the work out of this chore. The pipes are raised hydraulically and held in place while being attached to the roof. These trailers save labor, and they save backs. And they save money. Every underground mine with pipes on the roof needs one of these. 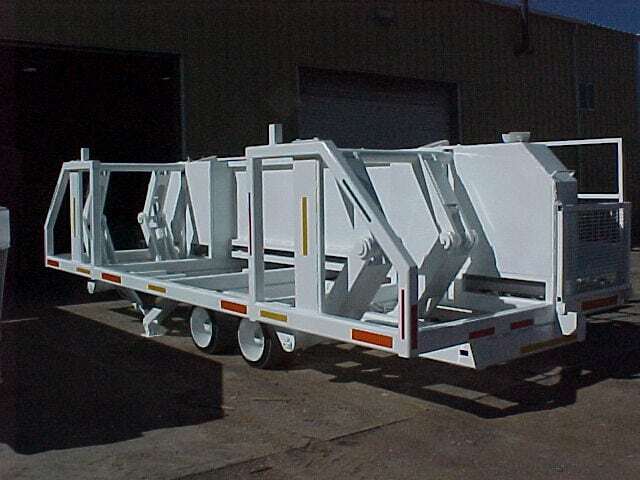 Uintah Machine designs and manufactures several types of pipe trailers. A basic pipe trailer is built simply for transporting pipe. Another variation steers from both ends for a smaller turning radius. Our most sophisticated models are designed to carry pipe into the mine and then facilitate an easy installation. The pipes rest on two racks which hydraulically lift the stack to a height suitable for two workers on a walk-deck. The workers then position individual pipes in the cradles of two hydraulically-operated positioning cylinders which allow for universal motion and ease of installation. Both pipe decks and both positioning cylinders are built so they can be controlled individually from the ends of the pipe trailer. The pipe is then raised into place and attached to the roof, all without any strenuous lifting involved. Uintah Machine is justifiably proud of our pipe handling trailers, and believe them to be the highest-quality, lowest-maintenance and most serviceable pipe trailer available anywhere. Email us or call us at 435-738-2453 and let us tell you about them.